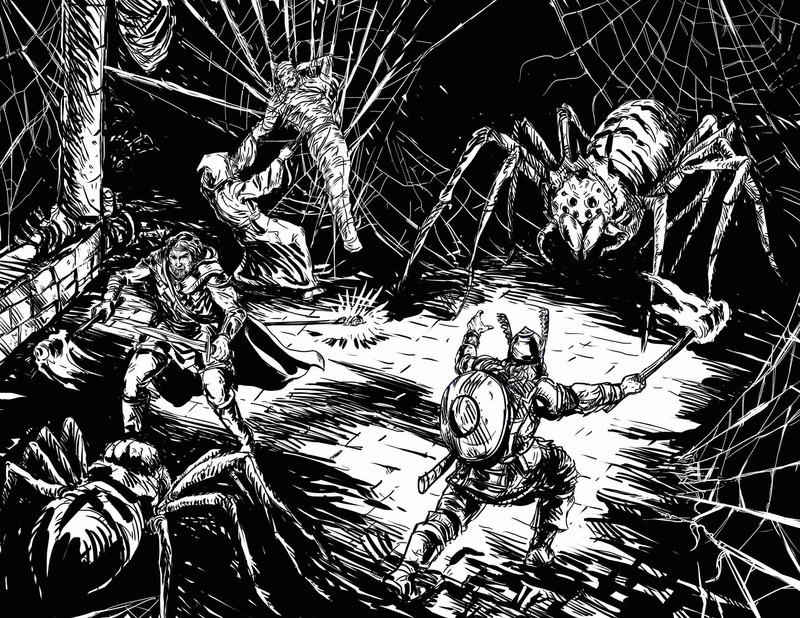 It seems adventurers are always poking about in dusty, seemingly abandoned crypts. Often the lairs of the blasphemous undead or the repository of forgotten treasures such places draw adventurers like moths to a candle. Here, water oozes down the walls from above leaving tracks on the ancient brickwork. On the ground, the water has turned the dust into thick paste-like grey ooze. Dusty cobwebs fill the corners of the ceiling. A small portion of brickwork from one wall has fallen away revealing the bare rock behind. A low pile of rubble lies on the floor nearby. Incongruously, a single bone—a thighbone—lies on the floor in front of a shadowy archway. The walls here were once decorated with brightly painted images painted directly onto the smooth stone. The colours have long since faded, and now only a suggestion of what once was remains. A section of floor is bumpy and uneven, making rapid movement difficult. The paving slabs can be easily pried up, but nothing of interest lies beneath. A pillar once held up the roof here, but at some point in the distant past it collapsed. Dust shrouds the resultant pile of rubble; the ceiling over the rubble sags dangerously. Several niches that once contained offerings to those buried here pierce the walls. All have succumbed to time’s remorseless advance and are now nothing more than small piles of rotting, rusting or desiccated remains. Huge religious symbols appropriate to the faith who built the crypt have been carved into the walls. Dust and cobwebs shroud portions of the carvings. Tracing the grandest of the carvings with one’s hand deactivates a nearby trap. Statues of the faithful garbed for war stand guard over this area. Half have serene looks upon their faces while the others’ faces are twisted with hate. The statues are arrayed so they all look towards the entrance. Niches cut into the wall each hold the shrouded skeletons of long-dead worshippers. Dust, cobwebs and other detritus cover the remains. The densely packed niches run from floor to ceiling. An ornate shroud edged with silver and gold thread covers the corpse in one of the particularly inaccessible niche near the ceiling. Several small holes pierce the wall at ground level. Small dried faeces—typical of that left by rats, mice or other rodents—covers the floor. Small holes in the ceiling emit a faint cold breeze into the chamber. The constant draught stirs the dust covering the floor. Paranoid explorers may think some form of invisible guardian lurks within the dust cloud. Carved holy symbols decorate the walls of this area. Several have been deliberately defaced, but there seems to be no obvious reason for this deliberate vandalism. A faded mosaic covers the floor. It depicts a stylised representation of the afterlife, but exact details are hard to pick out as some of the tiles are cracked and others are missing. Several burial niches in this area are empty. In all cases, discarded burial shrouds lie in the niche or nearby. Have the remains been removed or are they lurking animate guardians of the complex? A narrow ventilation shaft cut into the ceiling allows a thin ray of pale light into the crypt. Burial niches pierce the walls of the area (see #12 above). The remains of one of the interred have fallen from its niche and lies draped on the floor nearby. Cockroaches and other insects once infested this crypt. Feasting on the remains of those interred here they grew fat and numerous, but when they ran out of food they died off. Now their desiccated remains coat the floor and make moving quietly difficult (as they crunch underfoot). If you enjoy the table above and like dungeon dressing, check out GM’s Miscellany: Dungeon Dressing—Endzeitgeist’s choice as the number one book of 2014! Crammed with over 300 pages of information and charts designed to bring your dungeon alive, GM’s Miscellany: Dungeon Dressing is an essential part of any GM’s arsenal. Effortlessly add detail and versimilitude to your game! Epic! Thank you for signing up. We've sent you an email to confirm your subscription. Enjoy the 20 Things lists. I hope you find them useful and they make running your game easier and more fun. Great list! I love these things. They are so nice and easy to use especially for improvising quests. I love the last one. It is a great way to spice up a crawl. Not just more flavor but really making it more difficult to sneak around. Little things like this can really set a dungeon apart. Thanks! Thanks very much. Glad you liked it!